I was having difficulty emailing and/or copying from the Virtual Lab website, so I decided to create my own graph using the Create a Graph website you recommended. I also typed the journal questions and answers directly into my blog instead of using their journal because of the same issues. I have included screen shots from the Virtual Lab website to show that my work was performed there. Question 1: State a problem about the relationship of age and gender to blood pressure. Answer 1: Although age and gender impact blood pressure, there are other factors that impact it as well. Genentics and overall health also play a role in determining blood pressure. Question 2: Use your knowledge about the heart and the circulatory system to make a hypothesis about how the average blood pressure for a group of people would be affected by manipulating the age and gender of the group members. Answer 2: As age increases, average blood pressure will increase (for both men and women). Men will have higher blood pressure than women. Question 3: How will you use the investigation screen to test your hypothesis? What steps will you follow? What data will you record? Answer 3: I will measure the blood pressure of a group of women and a group of men for each age group. I will start with the youngest age group and measure a group of women. I will stay with the same age group and measure a group of men. I will move on to the next age group and repeat the process until I have gone through each age group. After the measurement is done for each age group/gender combination, I will record the measurements in the table. After the measurements are complete for each group, I will also review the medical charts and note hereditary history and unhealthy habits that may impact blood pressure. The data table is shown in the following two screen shots. I graphed the data using the Create a Graph website. The first graph shown below is the one from that website. The second graph is a screen shot of the graph generated in the Virtual Lab website. I was not happy with this graph. It was difficult to see the entire graph in one screen shot and the axes were labeled incorrectly. Question 4: Analyze the result of your experiment. Explain any patterns you observed. 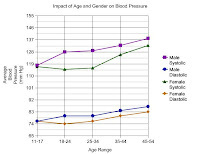 On average, females in the 25-34 age group have lower systolic blood pressure compared to females in the 11-17 age group. The average diastolic blood pressure of the same two age groups is the same. On average, the blood pressure of males increases as you move up from one age group to the next. Taking both systolic and diastolic blood pressure into account, the smallest change from one age group to the next is from the 18-24 age group to the 25-34 age group. This is true for men and women. The other contributing factors (weight, family history, salt in diet, exercise, and alcohol consumption) did not seem to have much of an impact on the blood pressure of those in the 25-34 age group. In other words, those in this age group could get away with being a few pounds overweight and/or eating a high salt diet without it negatively impacting their chances of having hypertension. The other contributing fators had a much greater impact for those over 35. Being overweight only did not necessarily mean one will have hypertension. When combined with one of the other factors, being overweight greatly increased the chances of having hypertension. There was not one of the other contributing factors was seen in every person with hypertension. Question 5: Did the result of your experiment support your hypothesis? Why or why not? Based on your experiment what conclusion can you draw about the relationship of age and gender to group blood pressure averages? Answer 5: The results of my experiment supported part of my hypothesis to a certain extent. I was correct that men would have higher blood pressure compared to women. I was partially correct when I said that as age increased, so would blood pressure. This was not true when comparing the average blood pressure of those in age group 11-17 to the average blood pressure of those in age group 18-24. Both the average systolic and diastolic blood pressure in the 18-24 year olds was lower than that of the 11-17 year olds. The conclusion that I draw is that in general, as you (male or female) get older, your blood pressure is going to increase. And men are going to have higher blood pressure compared to women of the same age. Question 6: During the course of your experiment, did you obtain any blood pressure reading that were outside of the normal range for the group being tested? What did you notice on the medical charts for these individuals that might explain their high reading? Answer 6: Yes, I did obtain blood pressure readings that were outside the normal ranges. I noticed that the high blood pressure could be explained by one of the other contributing factors. For example, most of those with high blood pressure were overweight, from just a few pounds up to almost 50 pounds overweight. I also noticed that most of those with high blood pressure also had one or more of the other contributing factors to blame for it. Some of them also had a diet high in salt, others did not exercise, while others consumed alcohol or had a family history of hypertension. There was only one person who was under weight that had high blood pressure. The only contributing factor that person was guilty of was eating a high salt diet. That person was also male. Question 7: List risk factors associated with the hypertension. Based on your observation, which risk factor do you think is most closely associated with hypertension? I think being overweight is most closely associated with hypertension. Question 8: What effect might obesity have on blood pressure? Does obesity alone cause a person to be at risk for high blood pressure? What other factors, in combination with obesity, might increase a person's risk for high blood pressure? Answer 8: Obesity has many negative health implications. But if you think about just the extra weight an obese person has to carry around....Their heart needs to pump enough blood to supply oxygen and nutrients to that extra weight. The additional blood flow required may increase blood pressure. All of the other factors (listed above) in combination with obesity might contribute to high blood pressure. A few other factors not listed are tobacco use and stress.